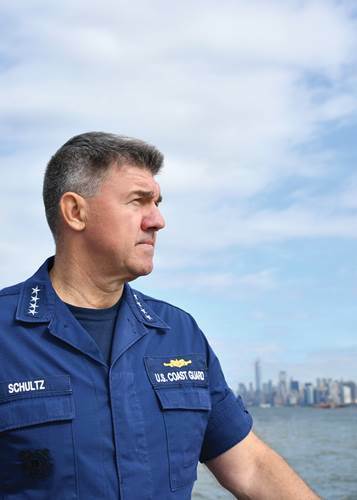 Coast Guard Commandant Adm. Karl Schultz,. U.S. Coast Guard photo illustration by Petty Officer 1st Class Jetta Disco. MarineLink gives us an interview with the Commandant. The first question was about the Polar Security and the Commandant gave the sort of answer we have come to expect, essentially, we need six icebreakers, at least three of them need to be heavy, and we need one now. The second question was about head count and the Commandant made the point that we are down in personnel and purchasing power compared to a decade ago. There was a comment that I find particularly encouraging, “We’ve done a ‘mission requirements’ analysis that Capitol Hill assigned to us.” It is not clear if this is essentially a manning study, which I suspect it may be, or if it perhaps includes other resource requirement. For quite some time, I have suggested we need to do an updated Fleet Mix Study. The last (and only) one was done about ten years ago. Not surprisingly, considering the orientation of the interviewer, there was much discussion about the Marine Inspection/Prevention side of the Coast Guard. There was a question about virtual aids to navigation and it appears the Commandant put to rest fears that we would be replacing physical aides to navigation with virtual ones, but rather that we would be adding AIS to physical aids. We would sometimes use virtual aids after a disaster, when needed to restore safe navigation as quickly as possible. Best you read the interview, rather than just my interpretation.